The 4900–4917 SAC305 No Clean Solder Wire is an electronic grade solder wire. It uses the predominant lead-free alloy composition and exceeds J-STD-006C and meets ASTM B 32 purity specifications. It is complemented with a no clean, synthetically refined, splatter-proof resin flux core that is classified as REL0 according to J-STD-004B. 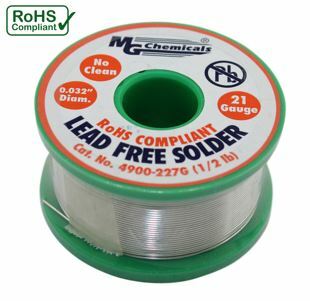 This solder is a great alternative to leaded solders.